It has become somewhat of a holiday tradition. 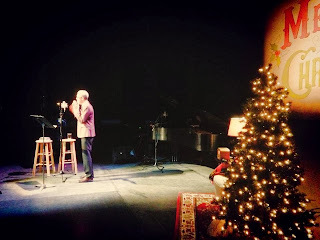 No, actually it is a Christmas tradition for Laurie Lane and I to connect for dinner and attend Stuart McLean's Vinyl Cafe Christmas. Last week was our 4th annual. Laurie picked me up and we headed to Prince Albert's diner downtown. She had watched an episode of "You've Got To Eat Here" that featured this little gem and wanted to check it out. We stepped inside this tiny diner and unbundled ourselves. One of the pitfalls of winter is the layers of clothing required for heading outdoors! All of the booths were taken, so we settled for a double table by the wall. I commented to Laurie as we sat down that you need an extra chair for your coat, hat, gloves, purse, etc. when the weather calls for such items. A tiny table for two just wouldn't do. As we started to check out the menu, our waiter approached the table and asked if we could please move so he could seat this larger party. Poop. We decided on sitting at the counter so as to still maintain a spot for our "stuff". As we settled in, I commented to Laurie that I felt like we were in a movie! Some great movie scenes take place at diner counters and how often do you ever get to sit at one? It was a great burger (I had peanut butter and bacon on mine!) and funky atmosphere as we caught up on life's events. And soon enough it was time to trudge through Victoria Park and get to Centennial Hall for the show. We settled into our seats and agreed that this is one of our favourite Christmas-y things to do. It's always a fun night. 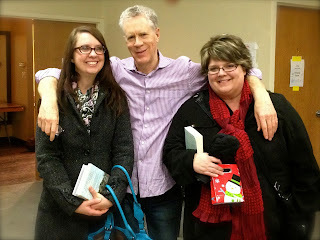 After the show, we were fortunate enough to meet Stuart and have him sign a book for us. We heaped appropriate praise on him for his work over the years and said good night. What a wonderful evening and Christmas tradition with my dear friend.